What % of people who sign up for a free trial actually end up buying? 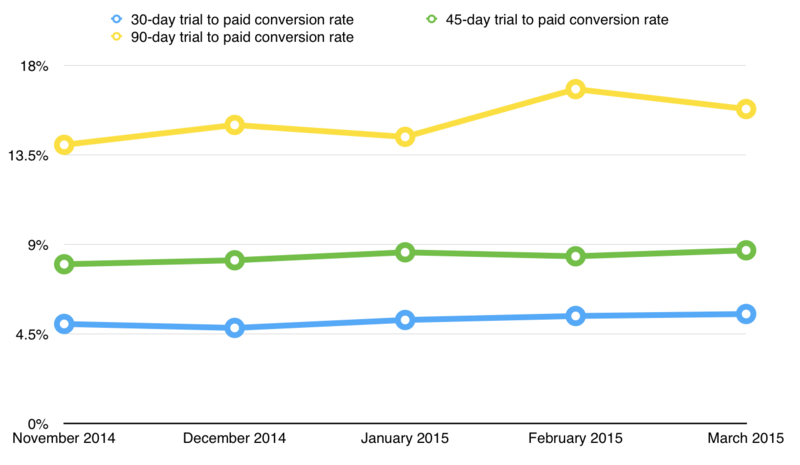 How do you measure trial-to-paid conversion rate to make the numbers really meaningful? Simply taking the number of free trials in a month and then the number of new customers in that month (or the next month) is too simple to be useful/accurate. You can decide what makes sense for your business, e.g. if you offer a 14 day trial then you will want to include a 14-day trial-to-paid conversion rate so you can see how many accounts convert by the end of the free trial period. EDIT (30/Oct/2016) – please see my note in the comments below for corrected formula. To calculate the 45 day trial-to-paid conversion rate for March 2015 you would take all the accounts (active trials, expired trials, paying customers, etc) that have their 45th day (since account creation) falling in the month of March. You then see what % of these accounts are now paying. This gives you the 45 day trial-to-paid conversion rate for March. There is a very clear definition of the metric and the definition is fully contained within the name of the metric. So there is no ambiguity about what is being measured. You can get a much better understanding of how your customers convert over time, e.g. in the illustration below we can see that after 30 days ~5% of trials have converted, after 45 days this jumps to 9% and after 90 days this jumps to 16%. This is very interesting because it shows that the majority of the customers are converting well after the standard 30 day free trial period is over. So this could tell you to keep up the sales efforts well after the trial and perhaps for at least 90 days or more in total. If your cohorts look like the above example, you certainly wouldn’t want to give up on your trials if they don’t convert by the end of their 30 day free trial. The above example is assuming you don’t operate a freemium business model with a free plan. In this scenario you could experiment with much longer time periods and other ways to segment customers – e.g. those who go directly to a paid plan or those who upgrade after some time on the free plan.